When George Porto joined Brazil's environment agency 13 years ago, the country didn't have access to satellite data on illegal logging -- let alone heat maps tracking deforestation patterns or gun-toting agents dedicated to stopping ecological crimes. How times have changed. Today, IBAMA, as the agency is known, has access to four satellite feeds monitoring illegal activities in the Amazon, the world's biggest rainforest. It also boasts a network of indigenous watchmen in remote regions and a 1,000-strong commando force. Environmentalists say the agency's control center in Brasilia, a collection of low-slung concrete buildings from the 1970s, is one of the world's most important hubs for protecting rainforests and the land rights of people who depend on them. "When I joined there was no GPS or satellite images, it wasn't a strategic way to tackle deforestation," said Porto, IBAMA's environmental monitoring coordinator, as he examined maps showing changes in forest cover at the agency's headquarters. "Today, the rate (of deforestation) is coming down because of our technology and intelligence gathering," he told the Thomson Reuters Foundation. For years, Brazil has sought to balance a desire to lift millions out of poverty by making use of the country's greatest natural resource -- the Amazon's trees, land and minerals -- and the need to protect one of the world's most biodiverse regions. Mounting pressure to save the Amazon, known as the "lungs of the planet" for its role sucking climate-changing carbon dioxide out of the atmosphere, prompted former president Luiz Inacio "Lula" da Silva to unveil plans to halt the Amazon's destruction. And in the decade following the start of his first term in office in 2003, Brazil reduced its deforestation rate by more than 70 percent, some of the fastest improvement anywhere. But the rate increased again last year by 24 percent compared to 2013, Brazil's National Space Research Institute (INPE) said in September, citing the latest satellite images. Brazil is still losing the equivalent of two football fields of rainforest every minute as illegal loggers and ranchers exploit the Amazon's unspoiled reaches, according to the National Forest Commission's former director, Tasso Azevedo. Satellites used by IBAMA recorded about 100,000 incursions into the forest last year. In a renewed push against the problem, Brazil has pledged to reduce net new deforestation to zero by 2030, down from more than 6,200 square kilometers (2,394 sq miles) today. Meeting this goal will require enforcement agencies leveraging new technologies to detect problems, and a sustained push for formal land rights, analysts said. IBAMA officials are also using a "carrot and stick" strategy to reduce illegal land clearing by both large agribusiness operators and small farmers. About 90 percent of Brazil's deforestation is illegal, much of it carried out by organized groups clearing land for agriculture, IBAMA officials said. Reducing the problem hinges on law enforcement targeting large operators who destroy the forest while providing peasant farmers with alternative livelihoods and title deeds to land, environmental experts say. To tackle the lucrative criminal enterprise, environment officials are fighting deforestation based on the logic of counter-insurgency. "It's a war," said Luciano Evaristo, IBAMA's enforcement director, slamming a fist into his office desk. When satellites detect large-scale forest clearing, Evaristo's agents, armed with automatic weapons, are deployed to hard-to-reach sites via helicopters. Before 2002, IBAMA didn't have its own field operatives. The agency monitored the situation and turned information over to other branches of the security services to conduct raids. "We decided we needed autonomy from the police, as they have corruption problems," Evaristo told the Thomson Reuters Foundation. "With the rise of pressure around deforestation, the government put us on the frontline." But in an area as vast and remote as the Amazon, it's logistically impossible for the state to be all-seeing, he said. Instead of long-term boots on the ground, officials rely on field intelligence from the people who know the region best: indigenous Brazilians. "The indigenous people are the eyes and ears of IBAMA," Evaristo said. Across the Amazon, networks of indigenous people gather information about illegal loggers that satellites can't access. They coordinate intelligence gathering in Quyapo or other local languages on radios provided by IBAMA. When unlawful activity is detected, they send GPS coordinates of the location back to Brasilia. Evaristo can then deploy a team to destroy illicit logging camps and torch their machinery. In the last year, Evaristo said his team has made more than 4,000 arrests, seizing 91 trucks, 115 chainsaws and the equivalent of 2,000 truckloads of wood. It is not only in intelligence gathering that indigenous groups have proven valuable. Lands formally recognized as belonging to indigenous people have far better forest protection rates than state or private lands. One study by U.S. and Brazilian environmentalists in 2015 showed that more than 98 percent of forests on indigenous lands were intact. These lands, however, are regularly threatened by "grileros" -- a Brazilian term for businessmen fraudulently obtaining or selling properties by bribing local land registry workers, doctoring ownership certificates and other dubious practices. "In this war, it's the indigenous people versus the grileros," said Evaristo, who keeps a loaded pistol in his briefcase beside policy papers prepared for lawmakers. To combat land theft by powerful agricultural interests, IBAMA began naming and shaming businessmen involved in deforestation in 2008. The publicly available blacklist now has 50,000 names, including 2,000 added last year. Blacklisted individuals face financial penalties, lose access to bank credit and rural land registries so they cannot buy new territory, making it harder for them to do business, officials said. IBAMA levied millions of dollars in fines for environmental crimes last year, but expects to collect less than 10 percent of the money due to Brazil's cumbersome legal system, Evaristo said. 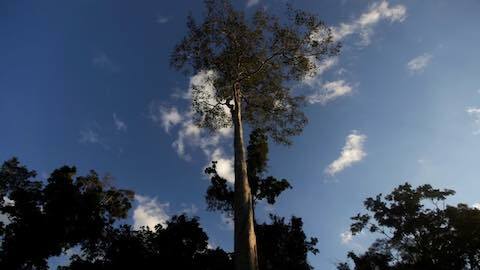 IBAMA officials say enforcement or "the stick" has worked well in reducing illegal cutting down of trees by large agriculture operations that are behind 70 percent of the Brazil's deforestation. But small farmers still account for about 30 percent of the deforestation and their share has been growing, said Avecita Chicchon of the San Francisco-based Gordon and Betty Moore Foundation, which has contributed hundreds of millions of dollars to protect the Amazon. "Poor people are moving into the Amazon for economic reasons and cutting the forest for agriculture," Chicchon said. Across Brazil, about five million families have no access to land, according to a 2016 study from Canada's University of Windsor. Landless farmers have few options to feed themselves other than clearing territory. Cutting by small farmers is harder to detect on satellite maps, according to IBAMA officials who hope "carrots" including formal land title deeds and access to credit for growers who do not cut down trees will help. The government has provided formal land title deeds to 20,000 farmers since 2009. For small farmers who own land, it's more profitable to work within the law and not deforest new areas in order to access credit and other government supports, officials said. By distributing land to small farmers while cracking down on large-scale illegal cutting, Brazilian officials say they can reduce net deforestation to zero by 2030. "Every act of deforestation has an economic purpose behind it," IBAMA official Jair Schmitt told the Thomson Reuters Foundation. "If you motivate people to follow the law, you can kill the business model." Latin America: "Inside Brazil's Battle To Save The Amazon"